I "cased" this card (with permission of course) from one of my friends from Stampin Canada. 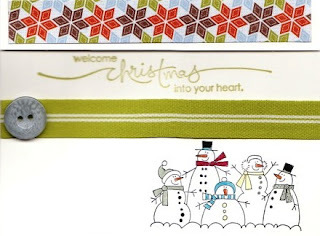 This card is almost identical to a card Sherry made for the "Jump Start Christmas" swap that I hosted. What a great use of acetate...I never would have thought to use it in the centre of the card like this to show the sentiment inside - brilliant!! Thanks for allowing me to copy and share it Sherry!